I sat at the kitchen table, looking out at a beautiful day. There were only two things in the way of going outside: the door and CBEST test anxiety. Feeling trapped in my house didn’t help me start studying. Attitude was a problem, but so was the overwhelming sense that I did not even know where to begin. And if I failed? I had been a good student at one time, but could I pass the CBEST test? 1. It had been years since a test had meant the difference between getting a job or not. 2. There was so much material to read in my CBEST study guides. What would the CBEST exam be like? 3. I have always been bad at multiple choice questions! All the answers seem right. 4. My CBEST testing date was approaching fast. Did I even have enough time to prepare? I felt alone in my CBEST test prep. At the time, it seemed as if I was the only one worrying about passing the CBEST. CBEST test anxiety put a huge weigh on my shoulder. It was a huge obstacle to getting a passing score. I had two choices. I could waste more time dwelling on my CBEST test preparation problems. Or I could do what any learner should do when faced with a problem: I could find a way to solve it. The following CBEST test prep ‘blueprints’ provide tactics that help you pass the California Basic Skills Test faster and in less time. Can CBEST Practice Tests Solve These Types Of Problems Including Test Anxiety? The most important thing to remember is that you are NOT alone. Everyone will have at least some CBEST test anxiety since it’s a high-stakes teacher certification exam. Dr. Tamar Chansky, PHD, says that test anxiety is dysfunctional when you get so stressed about an exam that you avoid preparing for it. Guess what happens then? You fail. Just as you thought. 1. Use CBEST practice tests. The Institute of Education Sciences (IES) says this is almost always better than spending time studying the material. Look at reviews of CBEST practice exams online for proof! If it has been some time since you were in school or took an exam, PRACTICE! the reason they failed was they were rusty in test taking skills. Obviously, inaccurate reading of the test questions and/or mediocre skill in choosing the best answer choice can be enough to cause failure. 2. Use practice tests for the CBEST that have questions and answers like the actual exam. A research study done by A. J. Kulik showed that students who used practice tests achieved a higher test score. The more your CBEST practice test simulates the actual exam, the better. The more practice exams you take, the more gains you are likely to make. You’ll not only learn the content in an “interactive” and “hands-on” manner, you’ll actually be good at the skill of taking the CBEST test! Go to: Do You Have Any Of These Symptoms Of CBEST Test Preparation Failure? 3. Your CBEST practice test must have questions at the same level of difficulty as the genuine exam. Research the recommendations made by test-takers who have purchased exam practice materials. What do they say about the level of difficulty of practice questions? It’s better to have questions that are too difficult than too easy. Better yet, get the same level questions for the most realistic and accurate practice taking this test! 4. 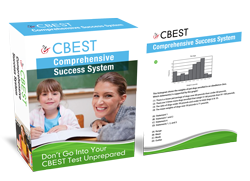 Use CBEST test practice questions that are error-free! A common problem mentioned often on CBEST test forums and blogs is that educators discover their CBEST practice questions contain errors and incorrect facts. It’s bad enough if you’re using free CBEST practice questions online and find errors in the answer key. It’s worse if you’ve purchased several sample exams and are nearing your test date. You may wonder how many wrong answers you have been studying—and how many weeks of your previous time you wasted! Just invest in the best CBEST practice test questions. The $20 you save in one CBEST study guide isn’t worth it if you fail. Being forced to postpone your bright future in education by months or even a year isn’t worth it. So imagine. What would happen if you dropped your test anxiety by 50% by using a method proven to boost your test taking skills and test score? — You’d most likely pass the CBEST! That’s great news. However, be sure you’re taking different CBEST practice exams over time. If you’re taking the same review questions over and over again, it won’t help you pass. Why Do Widely Used CBEST Practice Tests Have Incorrect Content and Answers? Unfortunately, recent college graduates with degrees in English or other unrelated majors are hired to write for pathetically low salaries by big publishing companies. They write all sorts of practice test questions for many exams, including the CBEST. …At your expense of course! Moreover, these “ghost writers” are encouraged to research the topics covered under very unrealistic deadlines. The result? It’s like the childrens’ story, “The Emperor’s New Clothes”! You paid good money for nothing! What you got was a CBEST practice test that was quickly thrown together and review book created by a corporate writer who has no credentials in your field and never took or passed your exam! In order to select quality, accurate CBEST practice test, follow the steps outlined below and minimize the chances of buying sub-par preparation materials. Select a number of CBEST questions randomly from the practice exam and compare the solutions with reliable sources. Check CBEST practice tests online from online book reviews like Barnes and Noble or Amazon. Often people who have found errors in these books will voice their concerns. Ask friends or colleagues who have used practice exams for the CBEST and ask for their recommendations. Do they suggest avoiding any particular material? Select CBEST practice exams and study manuals that have been recently published or recently revised. They will contain more up-to-date and more accurate exam prep information. Don’t always assume CBEST practice books from a well-known publishing house contain better quality and more accurate information. Just look at all the complaints on Amazon about practice guides with typos, grammatical errors, incorrect information and content that doesn’t follow the actual exam. Imagine this common scenario: A prospective California educator goes to take the exam and fails. Then, that person believes it was because of a failure on their part. That may not be the case. Sometimes it is because the practice tests used in CBEST preparation contain errors or simply didn’t cover the test content. Look for new CBEST exam practice material immediately, and apply the “Checking CBEST Practice Tests for Accuracy” check list above. It’ll be frustrating because time is short. However, cutting corners might lead you to study other sample exams and example tests that are also full of errors, wasting more time. As your test date approaches, and you continue to study, be sensitive to any confusion in your understanding of the content and/or academic skills tested. Do you need to locate more test prep resources to learn and get practice those skills so they are sharpened and refined for testing day? If your testing day is very near, review key concepts and make sure your understanding is in sync with reliable sources. If you fail the California Basic Educational Skills Test, the culprit might have been your CBEST practice tests and review guide, not you. Finding the best CBEST practice test seems like a big hassle. With so many test prep pitfalls in your path, take a little time to choose the sample exams that actually help you pass and make progress to your “big picture” life goals. But think about it. If you fail the CBEST, you have to start over again from the beginning. That means register for the exam, study again, and hope that THIS time, you will pass. At that point you’d end up paying hundreds of dollars more just in just testing fees. After failing you’d realize your old study guides, prep courses, flashcards and practice tests did not work. You’d end up paying a lot more money for CBEST practice tests and books than you would if you passed on the first try. So why not ensure success by choosing the best CBEST prep tools the first time? By using error-free CBEST practice test questions under realistic testing conditions, you can crush test anxiety and achieve ‘peak performance’ results.